One of the challenges in becoming a parent is to navigate feeding this new person. During the era of BC (before children) eating fell under two categories, quick and accessible (Panera, Au Bon Pain, Qdoba) or borderline luxury (Davio’s, Mistral, Abe & Louie’s). Sure we ate at home some, but that was generally relegated to breakfast or possibly a good dinner take-out from a variety of places whose numbers were stored in our phone’s memory. Cooking….what was that? Will reaping the reward from helping mom make dairy free Dunkin Hines brownies! Now that the small people have invaded our dining time we are forced to accommodate their eating needs, habits and restrictions. Parents can easily get sucked into power wars over food or find themselves making dinning selections that only a year before seemed like an unacceptable or ludicrous choice. Just yesterday, for example, as I was checking out of the new Market Basket a man placed his purchases on the belt behind me. His haul incorporated at least 10 4-packs of squeeze apple sauce (mixed fruit varieties) and about 20 Gerber brand stage two infant food ‘sweet potato’ 2 packs. Curious I asked how old his children were. 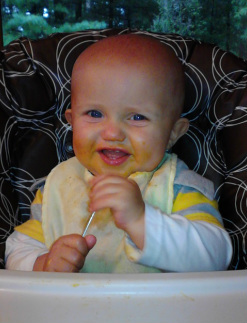 He (rightly embarrassed) admitted the entire buffet was for his 6 year old who just LOVES the infant sweet potatoes. I asked if they had tried sweet potato pie and he said “no – but great idea”. I thought about mentioning sweet potato fries but thought it best not to embarrass him any more than necessary. I would bet if you asked him 5 years ago if he would still be purchasing baby food for his 6 year old he would have said absolutely “No”– but there it was, on the belt, food to make his child happy, 1 two pack at a time. My older son went through quite a bit of food fussiness over the past year and a half. He was very limited in his food choices. Thank goodness for hot dogs and Spaghettios because sometimes there was nothing else he would swallow down. He would have just assumed not eat, than to eat something else. Very, very slowly new items were added – fish sticks (Costco’s were a hit and not full of junk either) and apple sauce sustained him for weeks. Then after just turning 2 years old something started to appear that sent us on a course of food discovery: eczema. Within a few months we had patches from the top of his head to between his toes. Matty enjoying a pickle he found wrapped in my lunch. Unfortunately, his outbreaks became more intense at the same time his younger brother was born (and no I don’t think Matty was the culprit). We were so caught up in Matty’s needs Will’s itches were only dealt with by over the counter hydrocortisone. It helped, but certainly did not stop the progression. 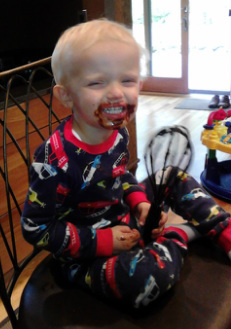 Matty showing that a good meal leaves its mark on you. Finally, by mid-summer I was able to get him into the pediatrician who shared my suspicions of a food allergy and dairy products were (mostly) stopped. The one item we held onto was nutritional drinks. We were so concerned with his lack of eating we had given him a daily dose of Ensure to try to bulk him up – regrettably it seems like that was the opposite of helpful. The good news was with the reduction in dairy he gained 2 pounds in two months – a record for him. While being dairy free, his appetite had markedly improved. He is eating so much more and trying new foods which is tremendous for him. There was a definite learning curve to sniff out the dairy as it is in so many products. We are fortunate however, to live at a time where so much is available dairy free that he knows little difference. In case anyone is interested, almond milk ice cream is quite yummy and soy milk gives hot tea a little something extra. Of course there were a few culinary casualties. Poor little guy loves doughnuts but those are an unfortunate no-no right now as are his beloved Spaghettios. Our younger son has been on Soy formula since I stopped nursing him. I am fairly certain we will apply the same food procedures with him, at least in the beginning, which we do with Will. I am optimistic they will outgrow their dairy issues, as many who only exhibit eczema seem to do. Luckily his allergy to dairy is on the mild side and will not put his life at risk if ingested as it may for others we know. In the grand scheme of ‘issues’ the dairy restriction is far from traumatic for him or us. Sure we had to learn what to shop for and what to avoid, but it is all well worth it to have a healthy child. I guess I’d even get him some of those sweet potatoes if that helped, although I don’t think there is any left in the store….